It is fair to say that, historically, Britain does not share the same close links with Cambodia as it does with some other countries in South East Asia. It is a country where we have no British Council presence and no UK aid programme (compared to Australia’s £30 million); where the French are supporting everything from infrastructure to agriculture and vocational training; and where the US alone has 40 times the number of British diplomats (we have three). You may be under the impression that all our diplomatic missions are of the scale of those in Washington, Islamabad or Beijing, but 43% of our 268 posts have four or fewer diplomats, who work with locally recruited staff. This is far from meaning there are no opportunities for the UK in Cambodia. The country has a population of 16 million and a GDP of US$18 billion, with a 7% growth rate. Cambodia’s major exports to the UK are garments, textiles and rice, while UK exports to Cambodia include vehicles, textile yarn and fabric, machinery and pharmaceutical products. Bilateral trade between the UK and Cambodia is now worth well over US$1 billion. The challenge we faced in the British Embassy in Phnom Penh was how to make the UK stand out. We decided to find the UK’s niche. What is the UK particularly good at that Cambodia particularly needs? It sounds simple, and it is, but it is not always the way we approach diplomacy. In Cambodia we wanted to move away from a concentration on traditional methods and issues. With 5,000 registered non-governmental organisations (although only half are actually operating), many people work on human rights, land rights, environmental protection and so on. However, an ingrained culture of corruption means that progress can be slow and frustrating. We focused on Cambodia’s potential, aligning ourselves with the most progressive parts of Cambodian society that were pushing for real change. Cambodia faces a huge skills gap that will significantly limit its potential to develop. There are shortages of engineers, doctors, electricians and statisticians to pull the country into the middle-income bracket. Nobody, it seems, wants to study STEM (Science, Technology, Engineering or Maths) subjects. They are perceived to be too difficult, not leading to well-paid jobs, and there is significant parental pressure for young people to enter the law and business management, which are seen as more prestigious. This was my cue for some quick googling of ‘UK STEM expertise’, to find out more about the National STEM centre and the huge wealth of activities, resources and programmes to develop STEM education in the UK. Following a call to the Cambodian Ministry of Education, and a suite of meetings with UN and development partners working on education, we had identified our niche – STEM education. As a trained neuroscientist, I have a personal passion for promoting science, especially among young people. I set a target of the UK becoming Cambodia’s partner of choice in STEM education by April 2016, and we are seeing that come to fruition. 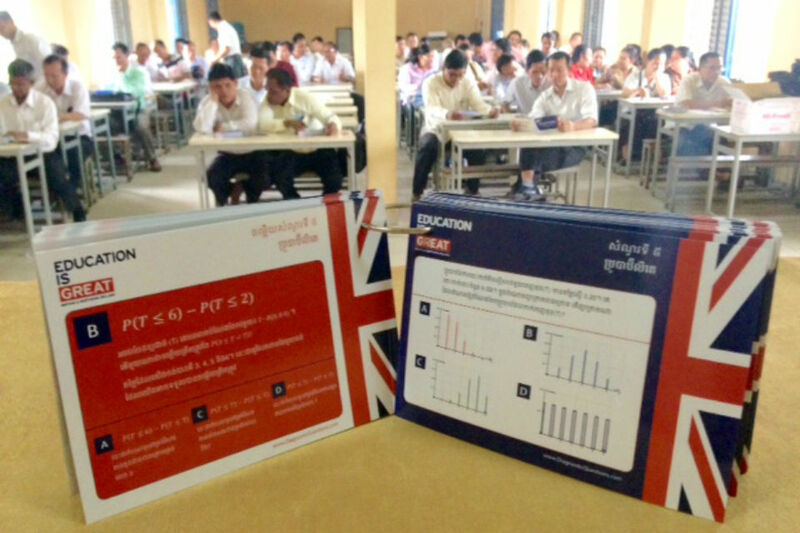 Since starting work on the initiative in May 2015, the embassy has brought an innovative new British Maths method to Cambodia and trained 1,100 teachers and students in this ‘diagnostic question’ (DQ) methodology, with the aim of increasing the Grade 12 Maths exam pass rate (currently at 10%). Diagnostic questions were developed by a British Maths teacher, Craig Barton, who we brought over to Cambodia to help with the training and to lead classroom sessions. His experiences were written up in the Times Educational Supplement. The idea of developing diagnostic questions in advanced Maths is to help teachers understand not only when, but why their students are struggling with key concepts. Multiple-choice questions are designed in which the wrong answers are selected to identify key misconceptions students might have in a specific topic. I thought this method would be particularly suited to Cambodia for two reasons. Firstly, Cambodian teachers often do not have sufficient training to enable them to be able to properly understand and explain more difficult concepts to students. Instead, they use rote learning, transcribing sections of textbooks onto a board for students to copy. The DQ methodology encourages an interactive approach and builds teachers’ capability by giving clear explanations of concepts and student misconceptions so that they, in turn, can help build the abilities of their students. Secondly, student-to-student learning is common in Cambodia, where brighter students run small study groups to help teach their peers. DQ is an accessible, easy-to-use method that makes Maths more fun and one which I thought would appeal to such student learning sets. In all, 100 questions were designed and printed by the embassy, covering a range of advanced Maths topics taken from the Cambodian curriculum. These were turned into attractive card packs, with the question on one side and the explanation on the other, and distributed to hundreds of secondary Maths teachers and students in Cambodia. Our Maths cards proved particularly popular at the 2016 Cambodian Science and Engineering Festival, where we set up a large STEM-themed GREAT stand. We have now converted the Maths cards into a smartphone app as well. The Cambodian Ministry of Education confirms that the DQ method has made a positive difference to the teaching of Maths for both teachers and students, and there has been an overall increase in the Grade 12 exam pass rate. the British Ambassador and I participated in TV talk shows and given lectures at universities on the importance of STEM. 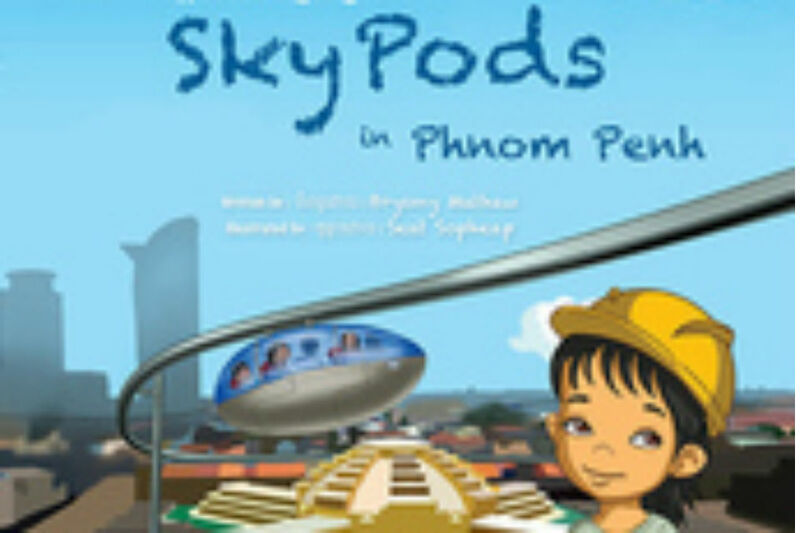 The launch of "Sky Pods in Phnom Penh"
I have also written a children’s book. Granted, this is a more unusual approach to diplomacy, but it seems to be working rather well. The GREAT-campaign-branded book is called Sky Pods in Phnom Penh and tells the story of how a young Cambodian girl with a great idea becomes an engineer. 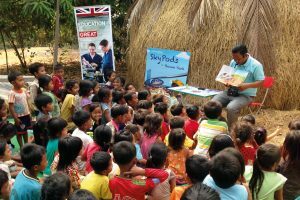 It can be downloaded at https://www.gov.uk/government/world-location-news/launch-of-new-stem-childrens-book-sky-pods-in-phnom-penh. It is aimed at five-to-10-year-olds, is written in English and Khmer and rhymes in both languages, because children can find it easier to learn in that way. It is about a girl called Kiri, who has to do chores around the house that interrupt her studies. She invents labour-saving devices for sweeping the floor and feeding the chickens so she can devote more time to studying. She goes on to become a great visionary engineer who designs a new transport system, Sky Pods, that carry passengers over Phnom Penh. The aim is to spark an interest in engineering from a young age and to empower girls. There are not many female engineers anywhere in the world – they represent only about 7% of engineers in the UK – so I wanted to show it is a career path for women as well. In a country with few 'fun' children's books, and none about STEM subjects, this book is truly unique and is proving popular. The Ministry of Education has asked for as many copies as we can provide to distribute to schools and libraries across the country. There is media interest, too. This niche is working for us in Cambodia. Doing business there tends to be slow and difficult, but the reaction to our STEM initiatives has been more positive than we could have imagined. The Cambodian Government has welcomed them enthusiastically and is keen to work with us to make them a success. The conclusion is that a little money and a lot of creativity can go a long way. We now have closer relations with key ministers and ministries, and an enhanced reputation for UK STEM educational excellence. We have received significant media coverage of our STEM work, and the UK is now regarded as the pre-eminent country for STEM education by Cambodia. We hope the trail we have blazed will be followed by British universities and vocational training institutes exploring market opportunities. More Cambodian students are applying to study in the UK (Chevening Scholarship applications are up 86% this year, after we encouraged STEM applications); and in the longer term there will be a greater pool of talented Cambodian workers businesses to capitalise on. How well this approach will work in other countries is difficult to say. It is, however, worth taking a step back every now and again and checking whether we have missed a trick or, rather, a niche. Given our global reputation and range of expertise, the UK is still well-placed to enter into partnership with countries in parts of the world where we may have less shared history or strategic involvement. We are home to 10 of the world's top 100 universities, and two of the top 10. More than a quarter of current world leaders have studied in the UK. And, just in case anyone is wondering, no, there are no sky pods in Phnom Penh – not yet, anyway. Fantastic. All the endeavours including the story, which needs sharing in the UK too. Thanks to Bryony and colleagues. Good article although had to go to the article from 14th March to explain what a sky pod was - i.e. "tuktuks and pods that take flight"
Thanks James. Good point. We have updated the article to make this clearer. What an inspirational project, what an innovative and aspirational approach Bryony. As STEM champion and ex-science teacher, I can see the work you are doing cuts right to the heart of the matter. Transformational. Unusually I found this so interesting I read right to the end. A win, win, situation....what a refreshing change. Very interesting and informative, Good luck to everyone involved, but especially the Cambodians. This is a brilliant project. I was in Cambodia on holiday 6 years ago, a very beautiful country. Lovely children were following us around the temples, to look after our bags and shoes when we entered inside. They wanted a dollar so they could go to school for half a day. We need to educate them so they can get out of poverty. The children said they wanted to go to school to learn English so they can study to be Doctors in England, and we should help them in every way to realise their dreams. A really interesting blog and a fantastic initiative. I am very much aware of the challenge here in the UK of trying to encourage more Students to continue to follow a STEM path in terms of their future education / employment options, so what you have achieved is amazing. beautifully written and so inspirational - thanks so much for sharing.